The Delaware Forest Service works to minimize damage from wildland fire through prevention and suppression activities. We provide staff and equipment at our Blackbird and Redden offices to help firefighters control wildfires. We also loan wildland fire suppression tools (backpack water tanks, hand tools, etc.) to volunteer fire companies to assist their suppression efforts. Our entire staff provides educational (Smokey Bear) programs for first-grade students as well as programs at various public events and fire company open houses. 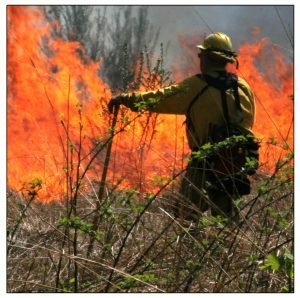 Our Forest Fire Supervisor also works with the Delaware Fire School, fire companies, and the U.S. Forest Service to train Delaware firefighters in wildland fire suppression techniques. Are you interested in participating in an adventure of a lifetime? Would you like to help protect human lives, property and precious natural resources during a national crisis? Do you have the mental fortitude, physical stamina and work flexibility to spend 14 days on a fireline far from home? 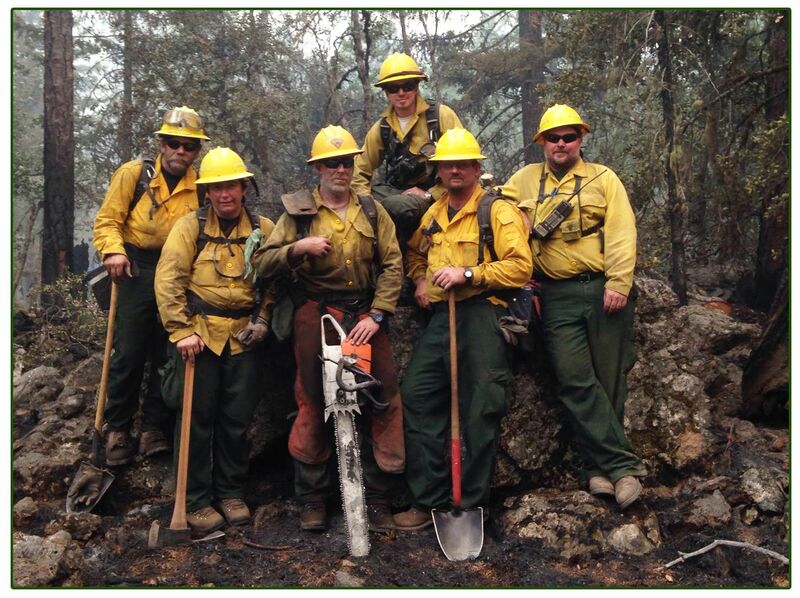 Check out the Wildland Fire Crew page. The Delaware Forest Service (DFS) maintains a cooperative agreement with the U.S. Forest Service to assist local volunteer fire companies with wildfire suppression and prevention on Delaware’s one million acres of undeveloped land, which includes approximately 380,000 forested acres. Delaware’s volunteer fire companies can request the assistance of Delaware Forest Service personnel, when needed, for wildland fire suppression. 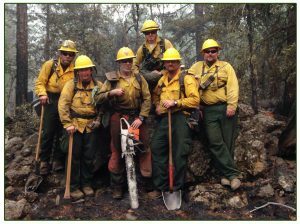 The DFS provides trained personnel, bulldozers equipped with fire plows to establish firebreaks, and wildland fire suppression tools such as fire rakes, hose, and collapsible backpack water tanks. 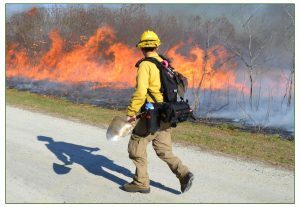 In FY17, the Delaware Forest Service responded to 13 wildfires that burned nearly 26 wooded acres. In addition, the Delaware Forest Service was on standby for local volunteer fire companies on over 100 brush/field fires. Delaware’s 60 volunteer fire companies are vital to the Delaware Forest Service because they provide much of the manpower and resources to fight wildfires in the state. In FY17, the Delaware Forest Service assisted 49 of Delaware’s 60 volunteer fire companies (82%) with wildfire suppression, loaning of equipment, or training. The Delaware Forest Service maintains two fire equipment supply caches, one at Blackbird State Forest and one at Redden State Forest. In addition to these supply caches, the Delaware Forest Service has two type 6 engines, three fire plows, and four UTVs with slip-in tanks that are available to help with wildfires. The VFA Grant program is designed to help volunteer fire companies underwrite the acquisition cost of pumps, hoses, and equipment to respond to and suppress wildfires. In FY17, seven volunteer fire companies received a total of $23,020 through the VFA grant program. 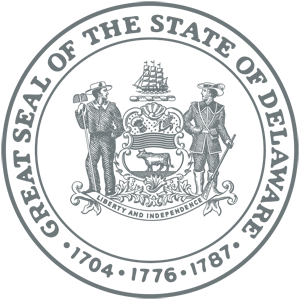 The 2018 VFA Grant program is now open to all Delaware volunteer fire departments. Applications must be received by the Delaware Forest Service office in Dover no later than May 1, 2018. No email submissions will be accepted. Grant materials are available at the links below. Applicants are urged to please take note of the submission instructions at the bottom of the application. Priority will be given to those companies that have not received DFS Grant Funding within the past three years, had members attend the 2017-2018 (S130/S190) classes at the Delaware State Fire School, and to those with members that participated in the Delaware Forest Service’s 2018 annual fire camp. Also, no vehicles (trucks/UTV’s/ATV’s) or structural firefighting gear (turnout coats, hardhats, gloves, lights, rescue saws, etc.) can be purchased with this funding. Funding is for wildland firefighting ¾-inch to 1-½ inch forestry hose, safety gear, brush unit pumps/skids, and hand tools. If you have any questions about the application process or what can be purchased, please feel free to contact Kyle Hoyd at (302) 698-4548 or by email at Kyle.Hoyd@delaware.gov. Each year, the Wildland Fire Program offers cost-share assistance grants and technical assistance to communities to reduce the danger of wildland fires. These funds are used to control phragmites in high priority areas through mechanical and chemical treatments. The Delaware Forest Service has had great success in controlling phragmites in the First State through a systematic spraying and mowing cycle over a three- to four-year period. In FY17, four grants totaling $20,475 were funded with State Fire Assistance NFP funding and were in their second year of spraying. The Delaware Forest Service conducts a successful prescribed burning program. In FY17, the DFS completed controlled burns on a total of 402 acres. These burns took place on federal, state, and private lands throughout Delaware with two new partnerships with U.S. Fish and Wildlife and The Nature Conservancy. Low intensity, prescribed fires provide benefits to the environment in many ways. For example, existing fuel loads are eliminated thus negating the possibility of a subsequent high intensity wildfire, the soil is enriched with nutrients that will help existing trees and the next generation of herbaceous plants, and habitat for a variety of animal species is greatly enhanced. The Delaware Forest Service plans to continue its prescribed burning program in the First State to mitigate fuels and to help native vegetation thrive by partnering with other state agencies. Are you interested in participating in an adventure of a lifetime? Would you like to help protect human lives, property and precious natural resources during a national crisis? Do you have the mental fortitude, physical stamina and work flexibility to spend 14 days on a fireline far from home? Every year, millions of acres of forests, marshes, and grasslands across the United States are ravaged by wildfire. But thanks to a training program sponsored by the Delaware Department of Agriculture’s Forest Service and the Delaware State Fire School, citizens from across the First State can qualify to serve on national fire crews. Since 1996, the Delaware Forest Service has trained more than 600 volunteer firefighters, and now every fire season deploys 20-person crews for out-of-state wildfire assignments. The program is growing and in need of additional firefighters who are interested in assisting the national effort to control and contain devastating wildfires. Delaware used to send one crew a year, but now can send multiple crews. In 2013, two separate crews fought fires in Alaska, Utah, and Idaho.